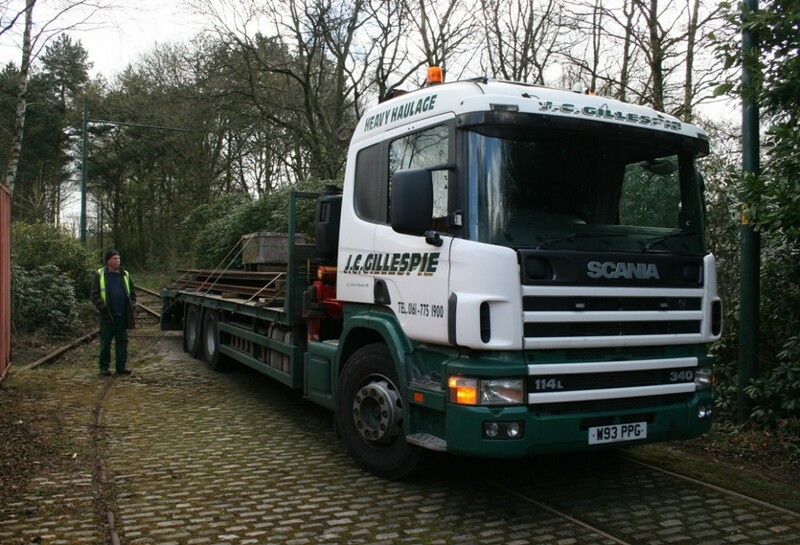 On Tuesday 30th April, some new track was delivered to the Heaton Park Tramway, Manchester to assist with the new Lakeside Depot project. 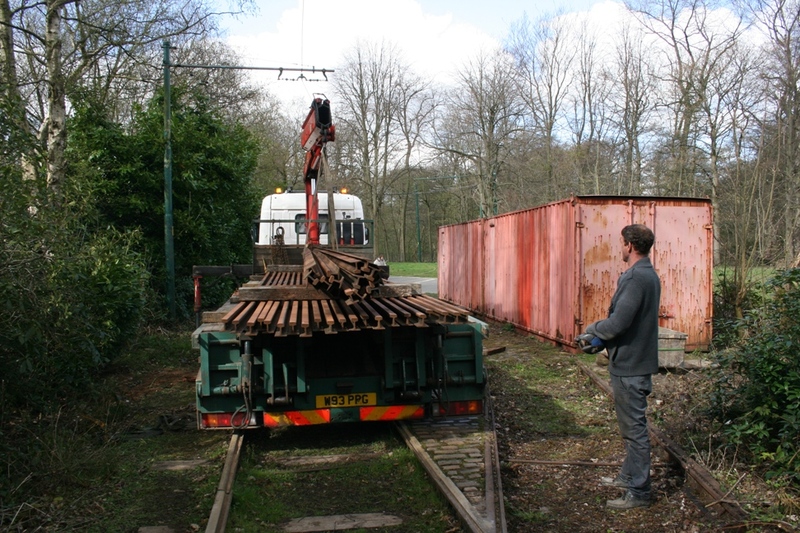 The rails had been acquired from Welshpool a little while ago, and were transferred to the tramway on this day for continued storage in anticipation of work on the depot building itself commencing in the near future. The track is not considered suitable for full-speed main line running, but will be more than adequate for general shunting of trams, and so will be laid inside the new depot. Obviously most of the time, trams will merely be standing on the track so this is a good use for it and will save the enormous expense of purchasing brand new track for the depot, which will not endure a great amount of wear and tear compared with the passenger line. Sufficient rail has been obtained from Welshpool to complete all of the required trackwork inside the building. On arrival at Manchester, the supply of rails was unloaded near to the old Lakeside terminus, with assistance from a small team of tramway volunteers who were on site to help. There it will be easily accessible when the time finally arrives for it to be properly laid in position. Unfortunately, various delays have been experienced which have put back the intended start date of depot construction works, but the Manchester Transport Museum Society remain confident that the new building will be open later in the year. This will of course put an end to the period of outdoor storage being endured by Leeds 6 and ex-Blackpool ‘Vanguard’ car 7, as well as allowing for the hugely anticipated move of Blackpool Ex-Towing Railcoach 680 to the park so that it can enter public service for the first time since 2008. Seeing these rails being delivered was certainly a taste of things to come and showed that despite various hurdles being experienced, great efforts are now being made to prepare for the most exciting development in the entire history of the Heaton Park Tramway.